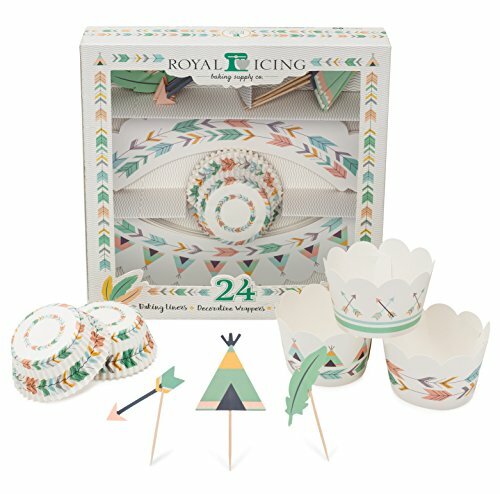 Boho Party Cupcake Decorating Complete Kit Includes Arrow, Teepee, and Feather Toppers, Scale, Tribal, and Bohemian Wrappers, and Extra Bonus! Wild One Baking Liners! Homemade doesn't have to feel like a hassle or look like a fail. Just use our boho cupcake decorations for professional looking results from the comfort of your own home. Your guests won't believe those cupcakes came from your kitchen. Although it features pastel colors and charming tribal patterns, our cupcake kit is far from delicate. It's durably made from premium baking paper. The wrappers, liners, and toppers won't tear, so don't be afraid to let your kids help. They'll love mixing and matching the three patterns to create 24 unique cupcakes. No matter the occasion, our bohemian arrow cupcake decorations will elevate your cupcake game. Set up a jaw-dropping cupcake display at your tribal themed baby shower or boho chic birthday party. Your finished cupcakes will make wonderful party favors too. CREATE 24 BOHO CHIC CUPCAKES - Use this 72-piece set to create 3 different styles of boho cupcakes. You get 24 cupcake liners, 24 boho chic cupcake toppers, and 24 standard cupcake wrappers. They feature arrow, teepee, and feather designs in gender-neutral pastels. STANDARD SIZE CUPCAKES - Unlike our competitors' smaller-sized cupcake baking cups, our Aztec cupcake liners fill the entire pan. You can bake, decorate, and enjoy standard-size tribal cupcakes with this cupcake decorating kit. FADEPROOF & GREASEPROOF - The bonus decorative cupcake liners are made from premium quality baking paper. They're resistant to higher oven temperatures, so they won't fade or stain after baking. These no fade cupcake liners won't lose shape either. QUICK AND EASY-TO-USE - Get party-ready in just 30 minutes. Whip up a batch of your favorite store bought cupcakes and get decorating. Fasten the tribal cupcake wrappers and add in the arrow, teepee, and feather cupcake toppers. Our cupcake decoration kit is so user-friendly that even your kids can help. PERFECT FOR ANY PARTY - Moms, girls, and boys love the trendy boho chic style of our cupcake decorating set. Whether you're throwing a wild one, be adventurous, or tribal woodland baby shower or birthday party, it has you covered. Manufacturer: Royal Icing Baking Supply Co. Brand: Royal Icing Baking Supply Co. Publisher: Royal Icing Baking Supply Co. Studio: Royal Icing Baking Supply Co. If you have any questions about this product by Royal Icing Baking Supply Co., contact us by completing and submitting the form below. If you are looking for a specif part number, please include it with your message. DaBuLiu 50 Pcs 2018 Graduation Cupcake Toppers - (Contains gold glitter powder),Graduation Party Mini Cake Decorations for Graduation Party.